Heat the oven to 400°F. Line 2 baking sheets with parchment paper. Sprinkle the flour on the work surface. Unfold 1 pastry sheet on the work surface. Cut the pastry sheet into 3 strips along the fold lines. Repeat with the remaining pastry sheet. Brush the pastry strips with the mustard. Fold over the edges of the pastry strips 1/8 inch on all sides, crimping with a fork to form a rim. Place the pastries onto the baking sheets. Prick the pastries with a fork. 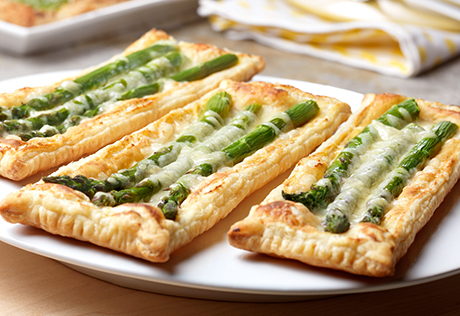 Arrange 3 spears asparagus on each pastry. Sprinkle each with 2 tablespoons cheese. Bake for 20 minutes or until the pastries are golden brown. Let the pastries cool on the baking sheets on wire racks for 5 minutes. Easy Substitution: You can also use smoked gouda or Fontina instead of the Gruyère.